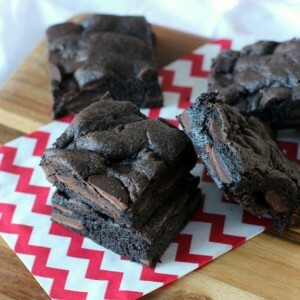 This recipe for Cake Mix Brownies is so simple, and makes the fudgiest, easiest brownies ever! Spray an 8x8 pan with baking spray, set aside. IN bowl mix all ingredients with a spoon until combined. Spread batter into prepared pan. Bake for 20 minutes. Allow to cool completely before cutting into squares. The center might seem underdone, but as the brownies set, they will be fine!